New Jersey Mover Review by Ron R.
New Jersey Mover Review by Mildred S.
Great company and great guy! Extremely careful with our items and constantly keeping us informed as they went along. Second time hiring them and will hire again. New Jersey Mover Review by Kay D.
The guys did a great job. They were very careful not to scratch the walls. The move went very smoothly. 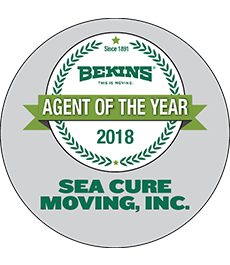 New Jersey Mover Review by Julie L.
We were very pleased with the service provided by SeaCure. They explained all of the paperwork, insurance and other details thoroughly. The movers were fun, respectful and every piece made it perfectly through the trip. Thanks! New Jersey Mover Review by LuAnn L.
New Jersey Mover Review by Arlene W.
New Jersey Mover Review by Barbara G.
New Jersey Mover Review by Mary B.